Cuba is a world leader in sustainable agriculture and its food production system became a model for other countries in the world to follow, especially developing societies that should be guarded against any damaging transformations. With the collapse of the Soviet Union and the tightening of the U.S. embargo, the early 1990s saw Cuba facing a severe food crisis and a collapse of more than 30 percent of the island's GDP. In order to tackle this grave moment, in which the Havana's government was unable to deliver adequate food supplies to the population, Cubans were forced to develop a new method of farming: urban agriculture, hopefully a sustainable way of land exploitation and food production. Even though it was not the result of a deliberate government policy, but rather an unfortunate consequence of helpless events, the results of this new system led Cuban authorities to adopt specific measures to incentivize its expansion. This effort rendered the island a world leader in sustainable agriculture and its food production system became a model for other countries in the world to follow, especially developing societies that should be guarded against any damaging transformations. Cubans were not aware of their environmentalist turn. The scarcity of resources and farm inputs brought farmers to experiment with new methods and organic pest control. Organic principles were followed and locally available resources were used. They practiced crop rotation, intercropping, used green manure, and planted hedges. Furthermore, they used repellent plants such as common thyme, basil, marigold, maize or ruddles to reduce pest infestation or to attract beneficial insects. [x] Government educational programs endorsed sustainable farming methods, but farmers used, above all, traditional knowledge derived from elders or their childhood memories. [xi] Those new practices that we could define as agroecology represents "a whole-systems approach to agriculture and food systems development based on traditional knowledge, alternative agriculture, and local food system experiences. "[xii] It turned out to be a model of food production that guarantees the preservation of natural resources and relies on minimum artificial inputs, from a sustainable perspective. A cornerstone of agroecology is diversification of both crops and farming methods -- including livestock integration -- that contributes to the promotion of biodiversity and of a more efficient use of resources, such as sunlight, water, soil and natural pests. Diversification intensifies natural processes such as photosynthesis, nitrogen fixation, absorption of soil phosphorus, and the enhancement of biological activity both above and below ground. [xiii] This diversification represented also a change of paradigm in Cuba, after the ultra-specialization on export of sugar and derivative products to the USSR during the Cold War. A sustainable agricultural model, such as the Cuban one, may be looked at as an alternative to improve food security and environment health. 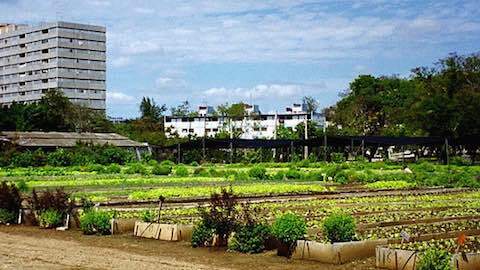 Even though its development was due to necessity, Cuba's urban agriculture has become a model for the rest of developing world. Cuba has a socialist political system in which property rights and agricultural policies are managed in a centralized way, significantly different from the rest of the world. As a result, the whole production process has been consigned to government oversight, from the distribution of the land, seeds and agricultural inputs to commercialization. However, the evidence of the island's success in sustainability highlights the potential of urban agriculture, or "urban agroecology", as a way of food production for sustainable megacities and even smaller towns around the world. Cities usually depend on imports from rural areas for their supply of water, energy or food. Thus, city dwellers are usually more vulnerable to unpredictable changes, such as a national food crisis. [xxi] Therefore, food production within a city may reduce the dependency on external resources. Sustainable agriculture also promotes the amelioration of human health, encouraging the consumption of fresh fruit and vegetables. Indeed, following the changes in the agricultural system in Cuba there was a marked decline in death rates from diabetes and heart diseases. [xxii] Diabetes incidence decreased by 53 percent from 1986 to 1996 when the agricultural production change was taking place. [xxiii] Moreover, urban agriculture could provide employment and an income opportunity for marginalized parts of a city's population; in addition to this, greater inclusion and community building could be side effects of urban farming, which could contribute to making cities more livable and pleasant, improving the population's standard of living. [xxiv] Furthermore, sustainable and urban agriculture could be a way to achieve food sovereignty, a term defined as self-sufficiency and national autonomy for food production. Developing countries could view this goal as an interesting one to attain, and provide them with the flexibility to shift their monetary resources from food import to local investments. The development of urban agriculture will be difficult to promote and implement since there are many barriers to its unbridled success. Some of the challenges to face are access to land, the recognition of land rights, water availability, low soil fertility, pollution, and inexperience of new farmers, as well as the presence of cheap products on the market, produced in heavily subsidized agricultural sectors in the Western world. Also, urban land is usually a more valuable commodity than rural land and its use is fiercely contested. [xxviii] The quantity of water needed for food production could be difficult to find in a city. Furthermore, urban soils are usually polluted and near roads or industrial areas that could contaminate the products. [xxix] However, the urgency of food crises in developing countries and the negative impacts of climatic events on food production constitute a major effort towards the promotion and spreading of sustainable agriculture. Sustainable and urban agriculture was a logical response of Cubans to their resource constraints. Traditional low-input agricultural techniques, based on organic pests' control and crop diversification, has been the backbone of the ecological food production in Cuba. This system is also resource conserving, environmentally sound, socially inclusive, and a model to be followed by other countries. Indeed, it furthers food security and sustainable development for megacities and large towns all over the world, and it is particularly important for developing countries. The Cuban model is not perfect and the system still has ongoing problems, but it has met significant challanges in public and environmental health, even if unintended. The new uncertainty on the future of U.S.-Cuban relations has put on hold the countless economic interests that U.S. businesses, specifically in the agrarian sector, have in the island. However, the Cuban sustainable agriculture model should certainly be promoted, protected, and spread abroad. The question would be: how can this be done in the context of the current opening to the U.S. economy? This food production may be the only alternative for many developing countries fighting hunger to be able to assure the necessary sustenance to their own population and an opportunity for everyone to live in a sustainable world. Latin America: "Cuba, a Model of Sustainable Agriculture Towards Global Food Security"